How did you feel about your neighborhood as a kid? 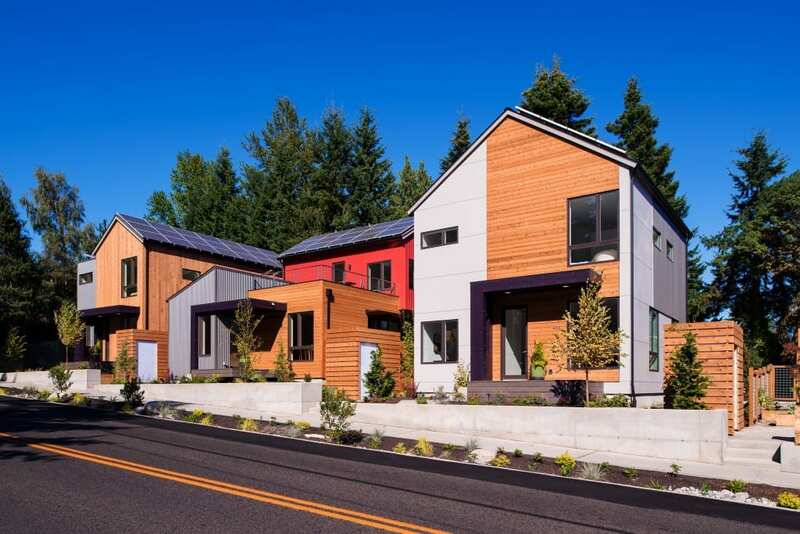 In the 5-minute lifestyle of the One Planet Grow Community, our homes are walking and biking distance from many family-friendly destinations, and they become such a part of our lives that we don’t even have to plan for them. 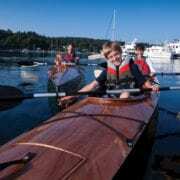 The Grow Community on Bainbridge Island offers so many activities that will live in our kids’ memories as part of where we live. For almost half the year, the Saturday Farmer’s Market in Town Square is just a block away. Kids experience the color and bounty of fresh local food, the energy of the music, and even a marketplace where kids are the artisans and vendors. Keep walking through the market, and just around the performing arts center is the Bainbridge Island Historical Museum, with fresh displays as well as the longstanding history exhibits. 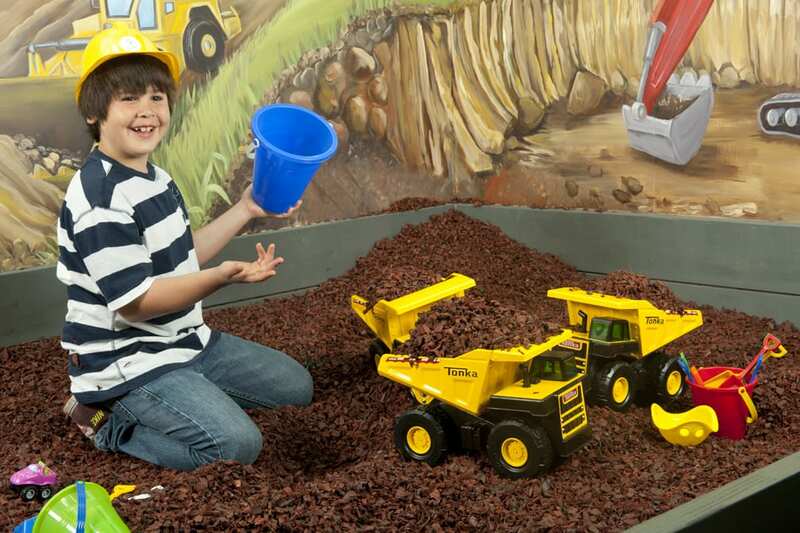 Come home by way of Winslow with occasional visits to the Curious Child for the latest instructional games and toys, and you’ve got a weekly tradition that will live on for years in your kids’ memories. On any day, a five minute stroll on friendly sidewalks through Winslow gets you and your kids to the playground behind the Town & Country grocery. From there, another 5 minutes on trails through Waterfront Park opens up to the beach. Low tide under the ferry dock is an unbelievable zoo of anemones, at least seven different species of sea stars, and frequent startling spurts from buried clams. A few times each season there are beach naturalists to help identify your finds. Bring rubber boots or water shoes, and don’t forget to buy the makings for dinner at Town & Country (grocery store) on your way back. 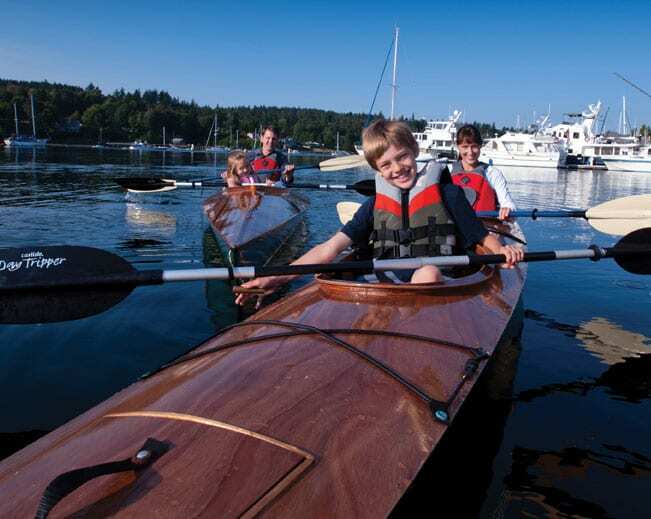 For the days when weather discourages extended outdoor time, the Bainbridge library is just a five minute walk up the street, and another five minutes lands you at the Aquatics Center for swim lessons or free play in the lazy river or down the 20′ water slide. Diagonally across High School Road from the library and behind the Commodore Options school is the Bainbridge High School Gymnastics Room that hosts many Parks and Recreation classes, including the urban gymnastics for older kids called Parkour (it’s much safer than jumping between tall buildings). that same route, kids probably won’t love their appointment at the Virginia Mason clinic, but stop at Mora’s ice cream on your way back and all will be forgiven. 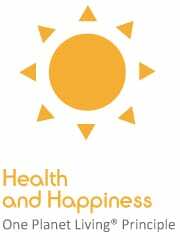 In the car-dependent life, we weigh the benefits of a great destination with the costs of our own energy and time getting kids buckled in, travel and traffic, and finally finding parking in the vicinity of the destination. Then there are the real costs of gas and parking and maintenance, but we don’t usually track these carefully, willing to accept an average monthly budget for such necessities. 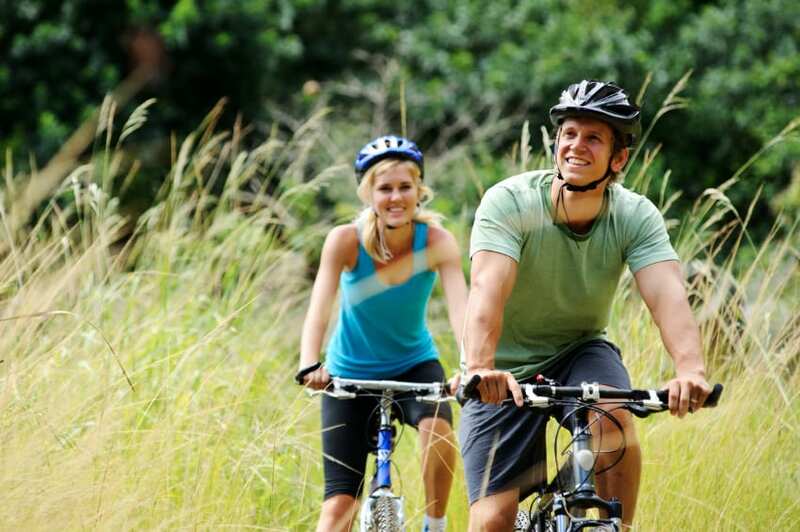 In a car-free 5-minute lifestyle, instead of a hassle, getting there is half the fun! 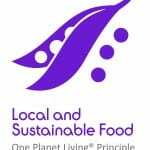 Sustainability is a concept sprouting up everywhere, defining much of what is associated with today’s cutting edge culture. Shedding a stereotype of an idealistic grass-roots environmental movement, today the concept of sustainability is ultra-cool, hip and hot across age and gender groups, a driving force in sales and marketing, taking the lead in shaping modern design and influencing business—using state-of-the-art technology as a foremost ally. 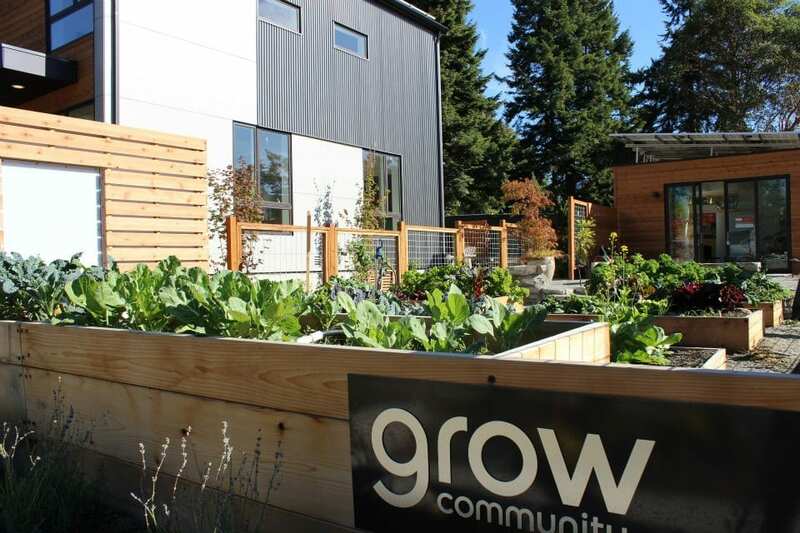 Leading the way in the concept of attractive, affordable, practical solutions for sustainable living in the United States is the new Grow Community on Bainbridge Island, Washington taking root near the heart of the Island’s commercial center in Winslow located only 35 minutes by ferry, directly west across from Seattle in Puget Sound. 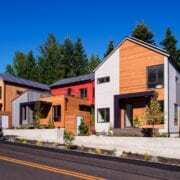 As a designer, and University of California Davis Design Department alumni, I am always on the lookout for new trends—especially in environmental design. So, when I stumbled upon Grow Community being built this summer during my initial visit to the Island, I must say, it was love at first sight! Warm colors and an array of interesting visuals drew my friend and me inside. Other passerby’s stopped in awe, generating a steady stream of pedestrian traffic with a positive vibe of satisfied intrigue…a collective sigh of relief was felt in the air of content excitement to see dreams and concepts actually being turned into a reality we could experience firsthand, and even purchase. 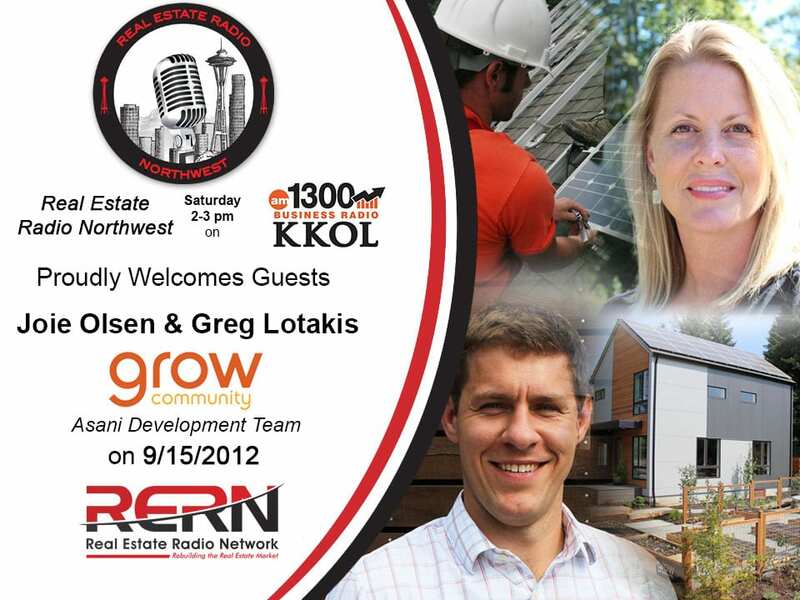 Grow team members Joie and Greg were interviewed by Nick Neal and Carolyn Frame on Real Estate Radio Northwest, a weekly show dedicated to “providing a forum for consumers to learn the truth of their financial life, which is mostly centered around their biggest investment, the home they live in.” Be sure to listen to the show segments by clicking the links below (give them a few seconds to load) as Greg and Joie talk about Grow Community and the family values, energy consciousness, and community living which the project is centered upon. Eating fresh and local on Bainbridge Island is as simple as stepping out your front door and taking a five minute walk to Downtown Bainbridge. Grow Community is uniquely situated for its future residents to enjoy the bounty of this beautiful islands local farms. We are a quick walk (or bike ride) away from restaurants which feature farm-to-table fare, the local grocery store which has deep ties to local Bainbridge farms and the local farmers market. Whether you’re looking to bring home the fixings for a local food feast, go out on the town or chat with the local farmers, you can be sure that your evenings meal supports the local economy and has made its way to your table from a farm only a few miles away. 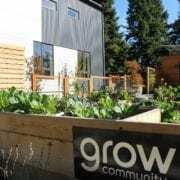 Read on for our selection of some of our favorite local food havens all within a 5 – 10 minute walk from Grow Community. 1. Bainbridge Farmers Market. 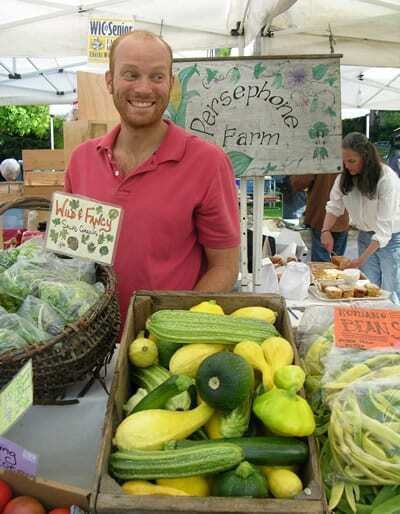 Bainbridge locals gather at the Farmers Market every Saturday. 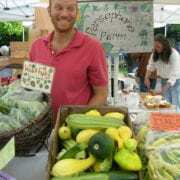 Open 9 – 1PM, the farmers market is less than a 3rd of a mile from Grow Community. 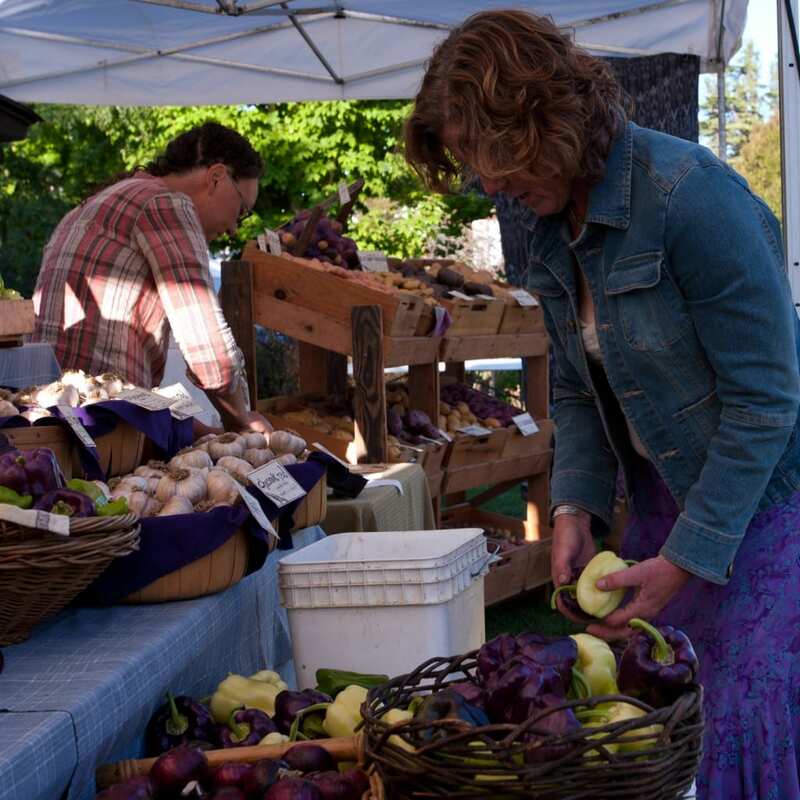 You will find here every local food need that your evening salad calls for and meet the local farmers that make it possible to eat healthy and local on Bainbridge Island. Location: Town Square at City Hall Park. 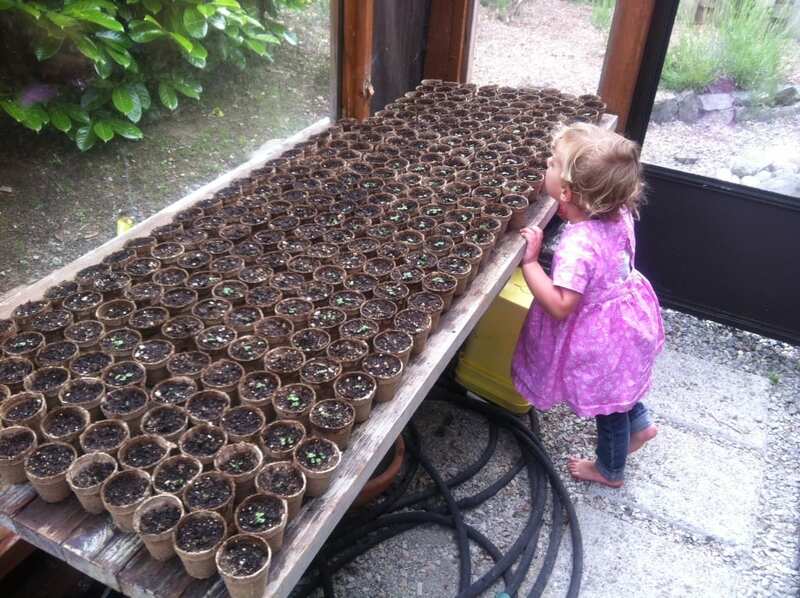 Come visit the Grow Team at the Bainbridge 4th of July street fair and take home your very own Grow basil plants! If you’re looking to connect with the Grow Team, why not come visit with us at our 4th of July booth at the street fair in downtown Bainbridge? The Grow Team will be at booth #64 and we’re giving away a basil plant to everyone who stops by! These little guys are starting to sprout and we hope you stop by and claim yours! Where to find us: Bjune Dr. below the Town & Country. Go here to see a map of all the booth’s during the fair—we’re at #64! If you’re coming from Seattle, go here for the ferry schedule. Leaving the ferry: Walk up Olympic Drive, take a left on Winslow Way E. and then another left on Bjune Drive. Take your first right to stay on Bjune Drive, and we’ll be right on your left. Let us know in the comments or on Facebook and Twitter if we can expect to see you! 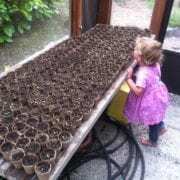 We’ll hold a basil plant for you. https://growbainbridge.com/wp-content/uploads/2012/06/basilthings2-1.jpg 766 1024 Grow Team https://growbainbridge.com/wp-content/uploads/2018/05/growlogo-300x110.gif Grow Team2012-06-25 21:14:592017-01-30 23:51:45Come visit the Grow Team at the Bainbridge 4th of July street fair and take home your very own Grow basil plants!